The Richard Evans Award is presented annually to a group of volunteers or organization in the heritage sector that has made an outstanding contribution to its community and to the celebration and preservation of our collective memory. At its 19th annual convention, held this year in Quebec City, June 9-10, QAHN presented this prestigious award to the Morrin Centre. Established in 1824, the Literary and Historical Society (affectionately nicknamed the "Lit & His") is one of the oldest cultural organizations in Canada. It has been resident in the Morrin Centre building since 1868. Like the building itself, the Society has survived by adapting to social and cultural change, and has persisted and thrived as an English-speaking institution in Quebec City, reflecting the Francophone, Anglophone, and now multicultural milieu of Quebec. The Society's library is the oldest English community library in Quebec; it has maintained a charming antique appearance even though it is now fully modernized and offers current reading materials along with its interesting historic collection. The Morrin Centre has become an active cultural hub for both residents and tourists, offering a wide range of musical, literary and artistic programs and events. There are tours of the building, a literary landmarks tour of Quebec, and children’s activities, including a reading program in the library. After extensive interior and exterior renovations, starting around 2000, the building has been restored and updated, but has preserved important elements of its long and interesting history and its different incarnations, including some of the original jail cells. The Morrin Centre is both a National Historic Site of Canada and a classified heritage site of Quebec. It is also a part of the UNESCO World Heritage Site of Old Quebec. 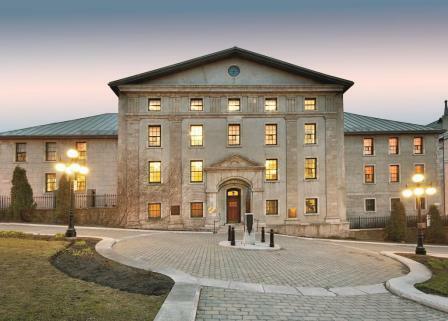 This imposing, neoclassical edifice, designed in the "Palladian" style by architect François Baillairgé, began life as Quebec City’s "common gaol" (or public prison). Construction on the building commenced in 1808 and concluded in 1813, with the first prisoners arriving in 1812. In 1868, the jail was relocated to a newer building on the Plains of Abraham, and the common gaol became home to the Morrin College. Named for its founder, Joseph Morrin, a Scottish-born academic and local community leader, Morrin College was associated with McGill University and offered courses in the arts and sciences. By 1900, however, the English-speaking population of Quebec City had declined and the college was forced to close. The building was then used mainly for the Literary and Historical Society library which had been located there since 1868 anyway. On hand for the presentation of the 2018 Evans Award was nominator Lorraine O'Donnell who outlined the importance of the Morrin Centre as a "hub of local Anglophone heritage and culture" in Quebec City.